Team Penske’s approach to today’s testing at Sonoma could prove to be a tactical masterstroke in the race for the IndyCar championship. The majority of teams involved in the ‘young driver’ test at Sonoma have taken the opportunity literally. Mathew Brabham (Andretti), Sean Rayhall (Ganassi), Ryan Phinny (KVSH), Ed Jones (RLL) and Jack Harvey (SPM) will run today alongside each squad’s recognized lead driver. Penske’s approach however is slightly different pairing Indy Lights driver Spencer Pigot with former F1 driver Nelson Piquet Jr. Including the newly crowned Formula E champion – by virtue of his single appearance at Toronto – could provide a critical edge for the defending champions. Both Braham and Phinny have sampled IndyCar this year at Iowa and Sebring respectively but beyond that, seat time for the young guns has been very limited. The same applies for Piquet Jr but the significant difference is the former Renault F1 driver’s experience. Sonoma’s double-points season finale will almost certainly decide the 2015 IndyCar series champion. Optimizing cars for the event will be the focus for today’s test and Penske have cleverly brought in a driver who can provide greater technical skills and feedback than the Lights youngsters can offer. Series drivers are not permitted to use up more than 50% of testing time meaning Piquet Jr will spend as much time as championship challengers Juan Montoya and Will Power in the Chevrolet machine today. 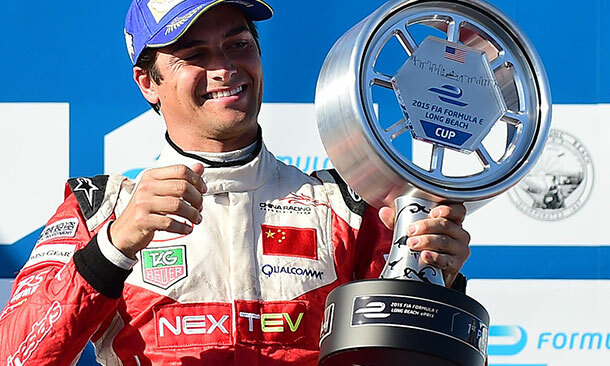 Piquet Jr is the defending Formula E champion & former F1 driver. Piquet’s frame of reference for feedback will be far greater than any of the other drivers testing for the likes of Ganassi and RLL who are very much in contention for the title. Given Montoya’s relative lack of performance at Sonoma last season – an eventual fifth place finish came after starting an atrocious 18th on the grid – more data and useable driver feedback could make or break his championship challenge. Though IndyCar is not on a par in technological terms with F1, much of what was familiar to Piquet during his testing and race time with Honda and Renault is now fundamental to the current generation Indy racers. Admittedly there is something slightly cheeky in taking this approach. Piquet Jr has not made any noises – publicly at least – about switching to IndyCar in the future. Aside from his IndyLights debut earlier this year he has not participated in any of the established IndyCar ‘ladder’ system. At 30 years of age he can hardly be considered ‘young’ (Rayhall is 20, Pigot and Brabham are both 21) plus he is signed on to defend his FIA Formula E title in 2015/16 and is mid-way through the Red Bull Global Rallycross season. That said, securing a move for someone of Piquet’s caliber for the IndyCar series would be a bonus. Piquet is one of a very few current top-line Brazilian single seater racers with significant profile and cache (or should that be cash?) to be of benefit to the series. With IndyCar’s existing Brazilian stars reaching the end of their careers, having no Brazilians would harm the commercial, broadcast and race prospects for the series. Irrespective of whether Piquet does or does not end up racing in IndyCar, his testing performance today could be the difference in whether Penske takes the 2015 crown or fails.